Home > Electrical Services > How Does Los Angeles’ Electricity Get to You? Last week, we figured out where LA’s power comes from and who’s supplying it to us. Perhaps unsurprisingly, the process is pretty complex. LA doesn’t draw all its power from anyone or even ten sources. The city generates power from different sources all over. Some of the sources are even thousands of miles away. How does electricity get all the way from a generator 1000 miles away to your house every day? As it turns out, it goes on quite a journey. This is the story of that journey, from the generator all the way to your house. Each of LA’s many power generators connects to a transmission substation (sometimes called a power plant). Generators continuously send the voltage they create directly to a nearby transmission substation. 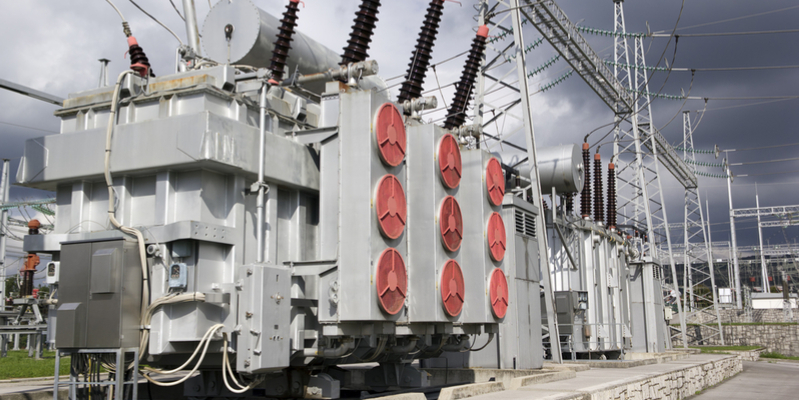 These substations use large transformers to convert the voltage the generator supplies from thousands of volts to between 155,000 to 765,000 volts. Transmission substations “step up” the voltage to prepare the power to travel long distances through the transmission grid. Whenever an electrical current is conducted through anything (like transmission lines), it loses some power to electrical resistance. The higher the voltage of the electricity in the transmission line, however, the less electricity resistance wastes. By “supercharging” the generated power’s voltage, transmission substations make sure it gets to you without losing its effectiveness. 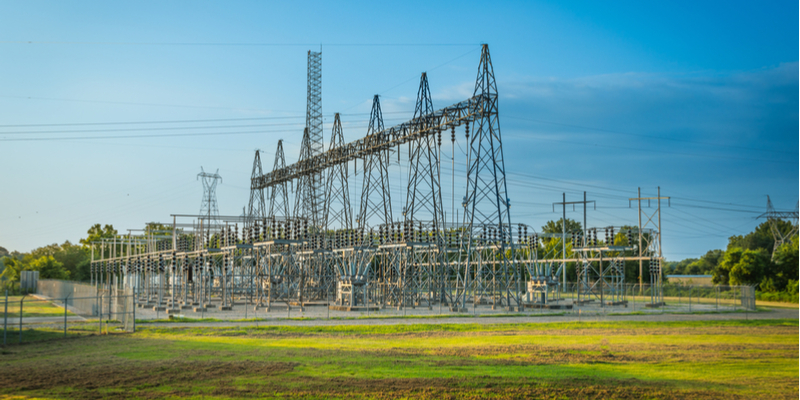 After converting low voltage power to very high voltage power, substations send electricity into transmission circuits. Transmission circuits are aluminum alloy wires that conduct electricity over hundreds of miles. These circuits run from the transmission substation near the plant all the way to local distribution substations. A single transmission line can successfully conduct electricity for up to 300 miles. 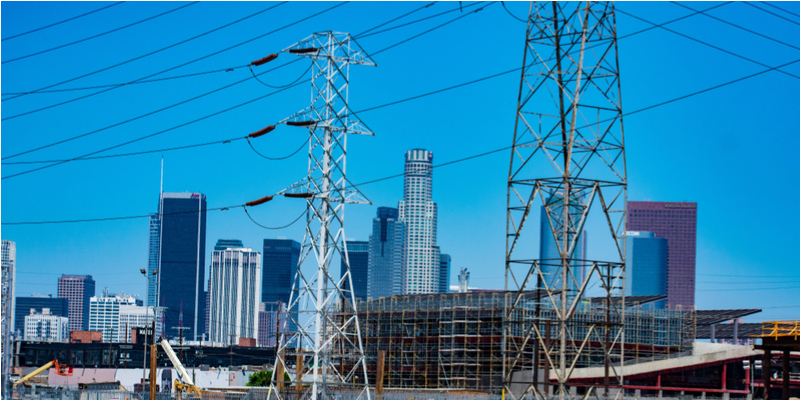 LA receives electrical power from transmission lines running across five states! There are two types of transmission circuit: overhead circuits and underground circuits. Overhead circuits transmit electricity over long distances. They’re supported by the giant steel transmission towers you’re probably familiar with. The LADWP maintains 3,507 miles of overhead power line, supported by 15,452 transmission towers. Electrical utilities use underground circuits in high-density, urban areas where there’s no room for transmission towers. LA uses 124 miles of underground circuits. Transmission circuits carry your electricity all the way from the substation near the generator to your city. By now, your power has traveled hundreds of miles via the transmission lines to reach your area. Before it can enter the distribution grid, however, it has to pass through another substation. These “step down” substations work exactly the same way as “step up” substations but in reverse. Instead of charging up the electricity with more voltage, these transformers remove voltage to make it safe for distribution. The exact amount of voltage a “step down” substation’s transformer removes depends on the area. Typically, distribution electrical power contains less than 10,000 volts. After passing through the transformer, electrical powers enters a “distribution bus.” The distribution bus splits the power off into multiple different directions. The bus is responsible for sending electrical power to multiple distribution lines, so it can cover a wide distribution range. LA uses 160 distributing substations to transfer its electricity into distribution. By now, your power has finally almost reached you. After passing through the “step down” transformer and bus at the substation, power enters the local distribution network. Like transmission lines, distribution lines (also called power lines) can be above or below ground. They also resemble transmission lines, albeit at a much smaller scale. LA’s distribution networks is, as you can probably imagine, massive. The city uses 6,752 miles of overhead and 3,626 miles of underground distribution lines. These lines crisscross all over the city to supply power to every single connected structure. 5. Distribution Network to You! Once the distribution line reaches your immediate area, it connects to a distribution transformer. These transformers are either supported on overhead poles or buried underground. 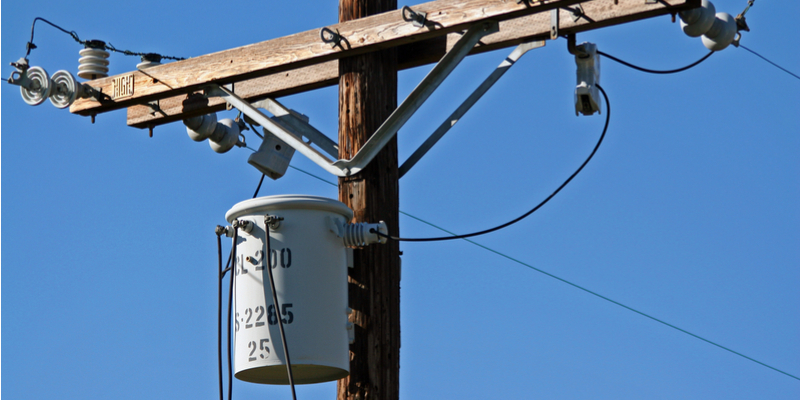 If it’s above ground, the transformer is a metal cylinder mounted on a nearby pole. If it’s below ground, the transformer is contained inside a green square utility box near your yard. There are 128,693 distribution transformers in the city of LA. Distribution transformers “step down” the amount of electricity running through power lines one more time. This process brings the electricities’ voltage down to around 240 volts, to make it safe for residential use. This stepped down electricity travels into your home’s service wire. This service wire runs from the distribution transformer all the way to your home’s meter box. The meter box records how much electricity is entering your home and the voltage of that electricity. Electricity passes through the meter box and into your circuit breaker, where it’s distributed throughout the home. Now you know where your power comes from and how it gets to you. But we’re not done quite yet! After all, you’re still not a part of this story yet. Once your power gets to you, how does it move through your home? How does it enter your electrical devices? Most importantly: what makes it safe to use? Next week, we’ll cover the final, most personal stretch of your power’s story: how you use it. Until then, if you have questions or need some help–electrical, plumbing, or otherwise–we’re always here to help. Your power made it all the way to you; we’ll make sure the trip was worth the effort!